The Peg Leg tilt stand system was developed to improve the operating convenience of the Yaesu FT-817 by raising the front about an inch and a half. The result is easier reading of the display, and better access to the front-panel controls. The Peg Leg is an ingenious device, designed and manufactured in Germany. 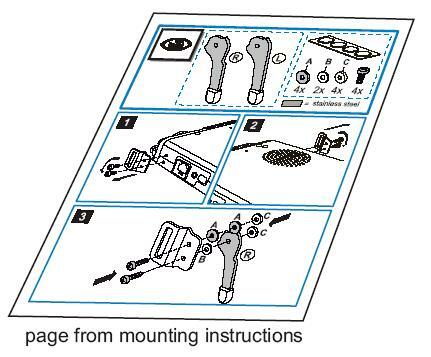 It comes as a kit including detailed mounting instructions and all necessary parts like washers, screws, etc. The Peg Legs are made of stainless steel for maximum strength, stability, and durability. 1. The Peg Legs are permanently attached to the radio, so you won't lose them or have to search for them before your portable activities. 2. The legs fold downwards in operation. They tilt back up and out of the way for storage or when transporting the rig. cover. An 817 with Peg Legs installed will stay put! 5. Installation of the Peg Leg system does not interfere with shoulder strap attachment. is tilted downward, we recommend using a right-angle co-ax adapter, or the front antenna jack.